Are you ready for the coming flu season? “Down under” in Australia where it is springtime, the number of flu cases has doubled over last season’s total. Could that be an indication of what we might expect soon in the northern hemisphere? According to self-proclaimed flu-ologist Dr. Anthony Fauci, head of the US National Institute of Allergy and Infectious Diseases, “…the only thing that you can predict about influenza is that it’s going to be unpredictable.”1 When it comes to flu, a reasonably precautionary approach might just be the best approach. According to the US Centers for Disease Control and Prevention (CDC), “Getting an annual flu vaccine is the first and best way to protect yourself and your family from the flu.” Scientists have known for some time that getting the vaccine can reduce flu illness, doctor visits, missed work and school, and flu-related hospitalizations. Now, a new study of children’s flu-associated deaths demonstrates that the vaccinesignificantly reduces a child’s risk of dying from the flu. The authors conclude that increasing flu vaccination could prevent flu-associated deaths among children and adolescents. How many children die of flu? The CDC reported 98 confirmed flu-associated pediatric deaths in the 2016-2017 season, which was characterized by “moderate” flu activity. There are many flu viruses. They change continually over time through minor genetic modification, and less frequently through abrupt genetic alteration. Flu vaccines are updated each year to match the viruses that are expected to be circulating that season. The hope is that the targeted viruses will not change so much after the vaccine is produced that the distributed vaccine will be ineffective. This year’s vaccine will “differ slightly from last year’s formulation,” according to an article in The Journal of Family Practice. It will protect against three or four viruses depending on the vaccination given. While the evidence from several past seasons demonstrate that the flu vaccine’s effectiveness is not optimal, routine use still prevents much illness and death. For example, in the 2012-2013 flu season, vaccine effectiveness prevented an estimated 5.6 million illnesses, 2.7 million medical visits, 61,500 hospitalizations, and 1800 deaths, according to CDC. CDC recommends everyone six months old and older get a flu vaccine before flu begins to spread through communities. Aim for getting your vaccine by the end of October (Vaccine before Halloween!2) to give the vaccine time (approximately two weeks) to develop maximum protection. Wash Your Hands: Washing your hands frequently and thoroughly is one of the most important ways to elude the flu. Flu virus particles are very good at hitching a ride from contaminated surfaces (door knobs and hand rails, for example) to your eyes, nose and mouth. Viruses can only spread by infecting new hosts, and they appreciate not being washed down the drain. Give them the slip with thorough hand washing (use an alcohol-based hand rub if soap and water are unavailable), and keep your hands away from your face. Disinfect Frequently Touched Surfaces: Destroy flu virus particles where they lurk to lower your odds of picking them up and becoming infected. Clean surfaces first with detergent and water and then sanitize using 2½ tablespoons of high strength household bleach (8.25%) per gallon of water or ¼ cup regular strength (5.25-6%) bleach. Alternatively, wipe down surfaces with disposable pre-moistened wipes containing chlorine bleach. Maintain a Healthy Lifestyle: Get adequate sleep, maintain a healthy diet, stay hydrated and exercise regularly to keep your immune system on alert against flu and other infections. Take a Sick Day: If you do get the flu, stay home and limit your contact with others. 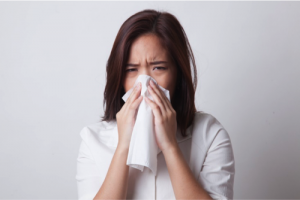 Cover your coughs and sneezes with a disposable tissue and wash your hands after using tissues. Tissues not available? Cough or sneeze into your elbow to help prevent projecting thousands of infected mucous droplets into the air that others breathe! Keep your distance from those who appear to have flu symptoms but have opted to be out and about anyway. Finally, are you curious as to where flu is spreading in the US? You can monitor flu activity by visiting CDC’s FluView. The website is updated weekly. Stay tuned and be ready for the coming flu season! Ralph Morris, M.D., M.P.H., is a Physician and Preventive Medicine and Public Health official living in Bemidji, MN. 2 See, for example, this WJHG.com video.